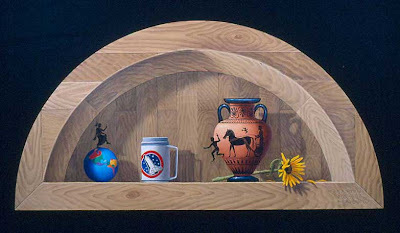 This still life was painted in MCMXCVII. An ancient vessel with an image of a chariot and warrior is contrasted with a contemporary travel mug bearing the image of a space shuttle vehicle. Thoughts about love, the past & future, the Challenger disaster and a Dave Mathews lyric ran through my head: "hike up your skirt a little more and show the world to me". The painting is titled "Wanderlust".